5 x 10/100/1000 ports, 8 x FXO, 1 x 500GB Storage, 200 Extensions, 24 VoIP trunks. FortiVoiceEnterprise-200F8, 5 x 10/100/1000 ports, 8 x FXO, 1 x 500GB Storage, 200 Extensions, 24 VoIP trunks. Call Center and Hotel licenses supported. The FortiVoice Enterprise IP PBX voice solutions give you total call control and sophisticated communication features for excellent customer service and efficient employee collaboration. Powerful, affordable and simple, FortiVoice Enterprise systems deliver powerful features and value to offices with up to 10,000 phone users. FortiVoice phone systems include everything you need to handle calls professionally, control communication costs and stay connected everywhere. User appeal Your people will like it too. The FortiVoice personal web portal lets your staff view their call logs, configure and manage their own messaging and access other features. Your employees get control over their phones, and your IT staff get a break from having to configure every little change. Rich call features - Line/extension appearance, call queue, call barge, phone profile, ring group, call recording, rule-based dial plan, individual/group voicemail, and much more. Flexibility - Multiple mode scheduling, flexible number management, re-assignable extensions, and caller ID modification. Ease of configuration - Visual auto attendant config, built-in DHCP server, auto phone provisioning and web-based management and user web portal. Comprehensive system monitoring - Real-time call status monitoring, call statistics, call logs, and call reports, and network traffic capture. 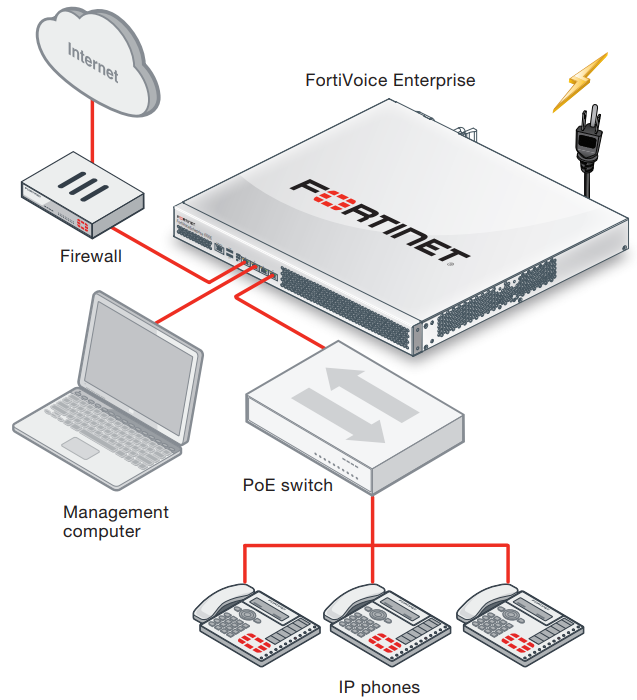 Download the Fortinet FortiVoice Enterprise Series Datasheet (PDF).